Sooner or later there will be a project wich uses rotary encoders and LEDs. I created these two units to test out the possibilities. 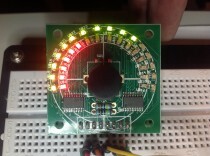 These are great circuits to be used on breadboard or as a building block in an enclosure.